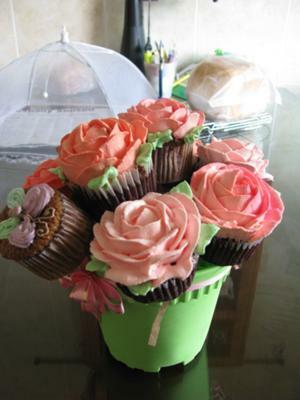 To make this pot of flowers cake, I have baked 9 chocolate cupcakes. 8 of the cupcakes were each decorated with a big rose. The last cupcake I pumped a butterfly on it. Then I arranged them on a plastic flower container. This cake was specially made for a friend's birthday.